The great Jamaican Beer we know today has set the standard by which other beers are measured since 1928. Today the company is a subsidiary of one of the largest and most profitable beverage and alcohol conglomerates HEINEKEN. Introduced in Jamaica in 2014 as a convenient option, Red Stripe in a can gives beer lovers the flexibility to enjoy their favourite brew whether at the beach, a music festival or at a sporting event. It's the same great Red Stripe taste in a convenient package. 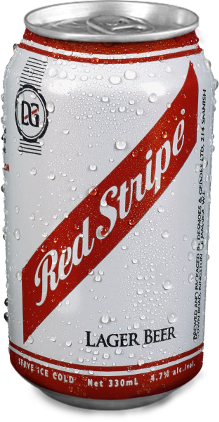 Capitalizes on the familiar combination - Red Stripe Beer and Lemon, combining them to create one great beverage. This product is a modern and sweet spin on a familiar Summer-time treat. It's Red Stripe with the sweet and crisp taste of lemon. It's Jamaica's first naturally flavoured full strength Lemon beer. 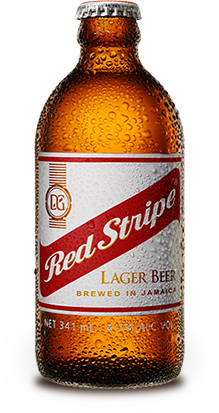 Capitalizing on two Jamaican favourites Red Stripe Beer and sorrel, combining them to create one great beverage. This product is a modern and unexpected spin on a traditional Christmas-time treat. It's RED STRIPE® with the sweet and spicy taste of sorrel. It's the world's first naturally flavoured full strength Sorrel beer.